September 12, 2018 at 11:14 pm. Jacob Park left the team in the days before that game and it wasn’t clear who would start between Zeb Noland and Kyle Kempt. But that doesn’t mean Kempt will be available Saturday when the No. 5 Sooners travel to Ames, Iowa. He remains questionable, with Noland the likely starter if Kempt can’t go. For Oklahoma, it’s the third consecutive week where they’ll prepare for an unknown at quarterback. Florida Atlantic coach Lane Kiffin kept his decision on a starter close to the vest before going with Chris Robison in the opener. Then last week, UCLA’s Wilton Speight was questionable after an injury and the starter wound up being freshman Dorian Thompson-Robinson. Oklahoma is dealing with an injury issue of its own, but there’s no doubt about the availability of Rodney Anderson. The Sooners’ star running back suffered a knee injury on the final play of the first quarter in last week’s win over UCLA and will miss the rest of the season. But Campbell said Oklahoma’s offense is still plenty potent — which was evident last week when the Sooners scored 35 of their 49 points after Anderson’s departure. 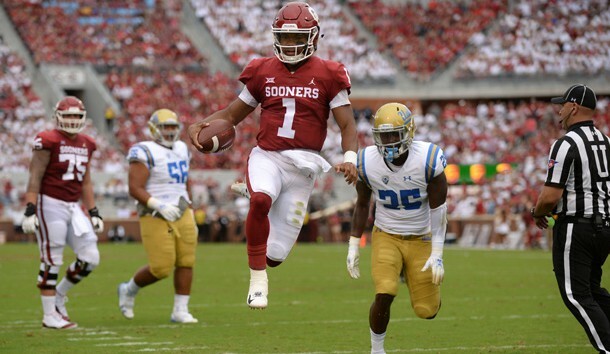 That punch includes quarterback Kyler Murray, who replaced Heisman Trophy winner Baker Mayfield this season and through two games has thrown for 515 yards and five touchdowns with one interception. He’s also rushed for 92 yards and two scores. The Sooners insisted this week that last year’s loss didn’t play into preparation for this game at all. “Nothing special about this game,” Sooners guard Ben Powers said. But in addition to marking a chance to avenge their last regular-season loss, the game also marks the beginning of the Sooners’ quest to win a fourth consecutive Big 12 title. “It’s the tradition here at Oklahoma,” Sermon said.